The name ‘Ultherapy’ comes from the technology behind it, Ultrasound. Ultherapy is more powerful than anything else on the market for wrinkles and sagging skin as we age. Ultherapy delivers heat energy or thermal coagulation points to a deep tissue layer of the skin where surgeons reach when they are performing a surgical face lift. No other technology can target this deep layer without affecting the upper layers of the skin- the epidermis or dermis. Ultherapy is often compared to Thermage , yet they have major differences. 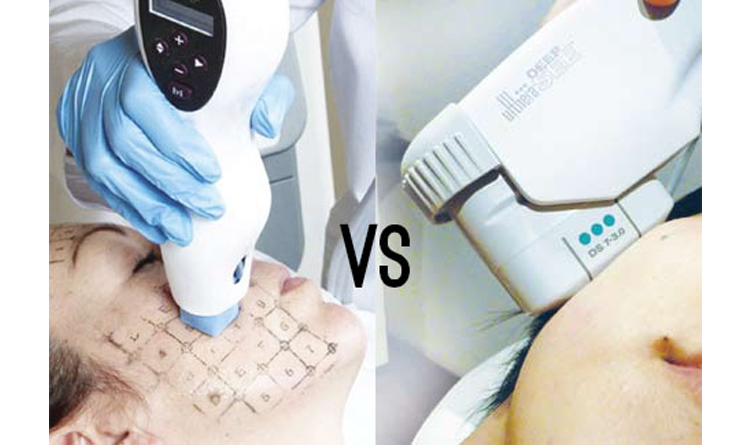 Thermage is radiofrequency technology which is bulk heating of the skin from the surface down. Thermage does not reach the deep tissue layer and causes significant heat and discomfort to the upper layers of skin. Thermage also requires multiple treatments. Ultherapy is delivered in just one convenient treatment, and the big benefit is no downtime, with visible changes as the weeks and months progress.